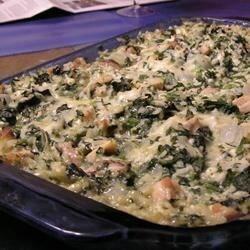 "An excellent and easy casserole that I actually made up with what I had one night when I was broke. I even surprised myself!" In a medium saucepan, boil 2 cups water and chicken bouillon. Stir in rice. Remove from heat, and set aside. In a small bowl, mix cornstarch with remaining water. Heat olive oil in a medium skillet over medium heat. Place chicken in skillet with thyme, sage, basil, parsley, and marjoram. Cook until chicken is no longer pink and juices run clear. Drain and cube. Stir onion into the skillet, and cook 5 minutes, or until browned and tender. In a large bowl, thoroughly mix rice, cornstarch mixture, chicken, onion, spinach, and cottage cheese. Transfer the mixture to a medium baking dish. Season with salt and pepper. Top with Parmesan cheese, and dot with margarine. Bake, covered, 45 minutes in the preheated oven. Remove cover, and continue baking 15 minutes, until surface is lightly browned. Didn't like this dish at all. It sounded great, but the taste was not to my liking. I even tried adding cheese on top. Sorry!